In Oxford there is a secret world that you may not be aware of. As darkness falls the street lamps are lit by Dragons. They are very secretive creatures and are very careful not to be spotted by grown-ups. Drago is a young Dragon who really really wants to be a lamp lighter so he can help light the street lamps of Oxford. Before Drago can learn to be a lamp lighter he has to learn very important lessons on how to be fire and road safe. He would like to help educate you so you can become safe too. 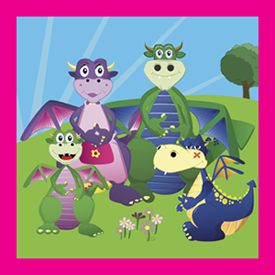 Enter Drago’s fun and safety zone for games, colouring, masks and Drago’s fire and road safety advice. You can even become a member of Drago’s fire safety awareness crew!